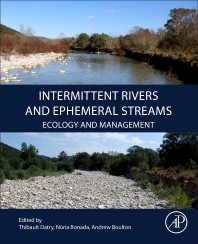 Intermittent Rivers and Ephemeral Streams: Ecology and Management takes an internationally broad approach, seeking to compare and contrast findings across multiple continents, climates, flow regimes, and land uses to provide a complete and integrated perspective on the ecology of these ecosystems. Coupled with this, users will find a discussion of management approaches applicable in different regions that are illustrated with relevant case studies. In a readable and technically accurate style, the book utilizes logically framed chapters authored by experts in the field, allowing managers and policymakers to readily grasp ecological concepts and their application to specific situations. Dr Thibault Datry is a senior scientist at IRSTEA (National Research Institute of Science and Technology for Environment and Agriculture) in Lyon, France. His research focuses on the ecology of rivers and hyporheic zones, with particular emphasis on intermittent rivers. In the past 15 years, he has published over 70 peer-reviewed papers and several book chapters on stream and groundwater ecology. He serves on editorial boards of two international journals, has organised two Special Issues and eight Special Sessions on intermittent river ecology management at international conferences. He is leading IRBAS (Intermittent River Biodiversity Analysis and Synthesis, http://irbas.cesab.org/), an international research program exploring biodiversity patterns in intermittent rivers at the global scale, and is Chair of SMIRES (Science and Management of Intermittent Rivers and Ephemeral Streams, http://www.smires.eu/), a pluri-disciplinary European research effort bringing together more than 200 scientists from 29 European countries. Dr Núria Bonada is Associate Professor at the University of Barcelona (Catalonia, Spain). Her research focuses on the biodiversity, ecology and conservation of river ecosystems, especially of those in Mediterranean climates, where intermittent rivers are part of the daily landscape. Over the last 15 years, she has published 80+ peer-reviewed papers and several book chapters, and has served on editorial boards of three international journals. She has participated in 20+ funded projects and has supervised several PhD, master and bachelor students. Regarding teaching merits, she has taught 1500+ hours of lectures in Ecology and Zoology at several Spanish universities. Dr Andrew Boulton is Adjunct Professor in Ecosystem Management at the University of New England, New South Wales, Australia. Over the last 25 years, his research has focussed on river and groundwater ecology, especially on intermittent rivers in dryland areas of Australia and the United States. He has co-written three textbooks (including ‘Australian Freshwater Ecology’ published in 2014) and over 140 peer-reviewed papers on stream ecology, river-groundwater interactions and aquatic ecosystem management and conservation. He has served on editorial boards of five international journals and worked with government agencies on riparian zone policies, environmental flows and management of intermittent rivers.